Rollerman 2007 in Korea, was so special. Jean Yves Blondeau was living at in a studio at MUJU Resort shared with guests and all the tools for building and repair BUGGY ROLLIN and BUGGY SKI. 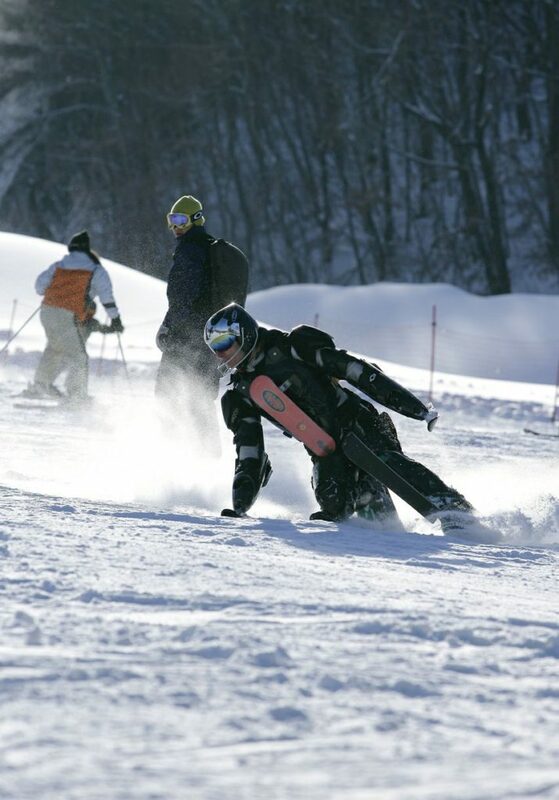 The opportunity to BUGGY SKI every day showed all the weak points of the prototype. Step by step every problem would be solved. Finally Jean Yves obtained a sustainable Ski Armor. Among the trouble shoot, snow infiltration, ski geometry, chest positioning, climat control, connectors strength. Side benefit was to become very fit and get very balanced body because of the really well balanced effort through the BUGGY SKI. During the winter we moved from Muju resort to High 1 Gangwon Do. Muju is a ski resort from the 80s that had to face bankrupt owners. It had to run on the existing equipments. The machine were old, so the snow was not perfectly prepared, and people would wait almost one hour at the lift on sundays. But the workers were really putting a lot of energy to gently welcome the skiers. Muju was also at a very strategic geographic situation the only ski resort of the half south of korea. It had no problem to get clients. High 1 was a brand new ski resort. It is situated in a remote area where the employment rate is very low. They organized special trains directly from seoul to the ski resort to bring customers. Our video shows that train, and all the events organized inside. It shows a mutation from BUGGY ROLLIN to BUGGY SKI. Suddenly all business stopped in South Korea. Business friends moved, phone number changed every things was over. Back to Europe have to start every thing again.